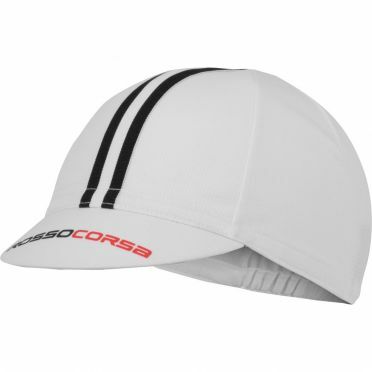 While not the most visible of cycling accessories, the Castelli Rosso Corsa Cycling cap white/black men nonetheless does a brilliant job. tucked under a helmet to wick away sweat and keep the sun's rays off the head. Polyester mesh ensures maximum airflow. Tip: keep in mind that the Castelli clothing fits smaller than normal. 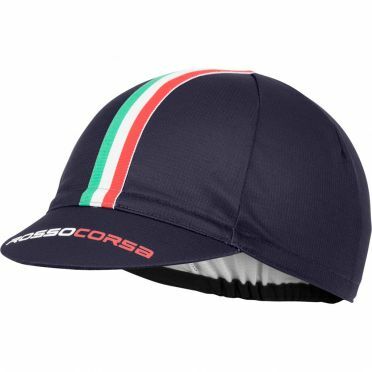 While not the most visible of cycling accessories, the Castelli Rosso Corsa Cycling Cap black men nonetheless does a brilliant job. tucked under a helmet to wick away sweat and keep the sun's rays off the head. Polyester mesh ensures maximum airflow. Tip: keep in mind that the Castelli clothing fits smaller than normal. 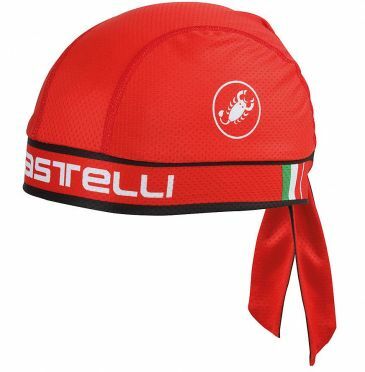 The Castelli Bandana red is so soft against your forehead that it doesn’t quite seem right. As soft as possible while keeping sweat from dripping in your eyes. Made from ProSecco strada fabric for a excellent wicking. The Castelli Bandana white is so soft against your forehead that it doesn’t quite seem right. As soft as possible while keeping sweat from dripping in your eyes. Made from ProSecco strada fabric for a excellent wicking. 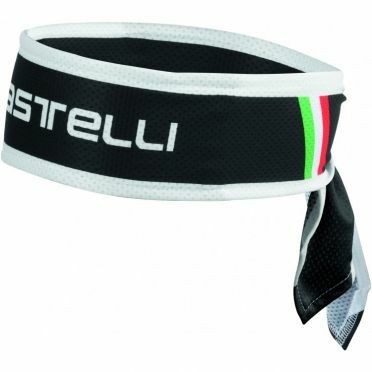 The Castelli Headband black is so soft against your forehead that it doesn’t quite seem right. As soft as possible while keeping sweat from dripping in your eyes. The Craft Shelter 2.0 under helmet black/yellow unisex is a lightweight, elastic helmet-compatible hat with wind-protective front. The hat features an ergonomic, close fit to be worn under your helmet, with a windproof fabric on the front for warmth. Reflective print at front and back. 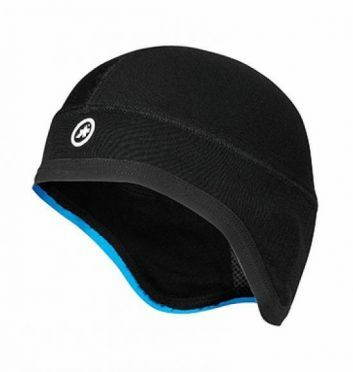 The windproof cap keeps you warm on cold days and protects your head from icy winds. The elevated, race-tuned Assos Neck protector winter black unisex to provide respite from the coldest weather and deliver core warmth. The perfect companion piece for winter rides, Assos have re-engineered the classic and ever-popular neck protector with their latest, ultra-luxe fabrics and retailored its construction for ergonomics. The result is indisputably high levels of comfort and warmth from this small yet hugely significant piece. Using the latest combination of natural and synthetic yarns, this piece is a whizz at providing wind protection and just as deft at breathability. The Craft Shelter 2.0 under helmet black unisex is a lightweight, elastic helmet-compatible hat with wind-protective front. 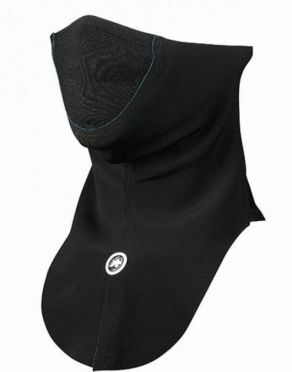 The hat features an ergonomic, close fit to be worn under your helmet, with a windproof fabric on the front for warmth. Reflective print at front and back. 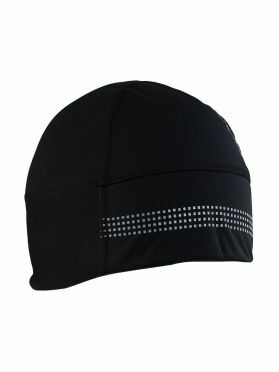 The windproof cap keeps you warm on cold days and protects your head from icy winds. 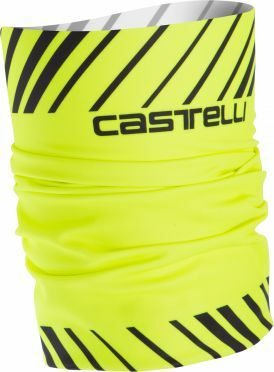 The Castelli Arrivo 3 thermo head thingy yellow fluo men is made of Thermoflex fleece fabric. Can be used as neck warmer, bandana or cap. With sublimation printed graphic. 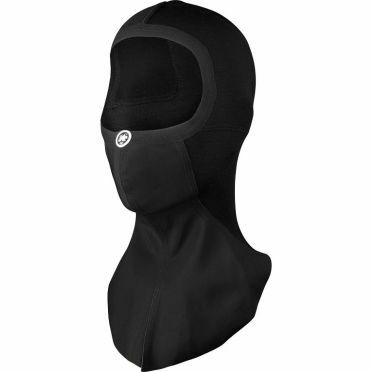 The Castelli Arrivo 3 thermo head thingy light black men is made of Thermoflex fleece fabric. Can be used as neck warmer, bandana or cap. With sublimation printed graphic. 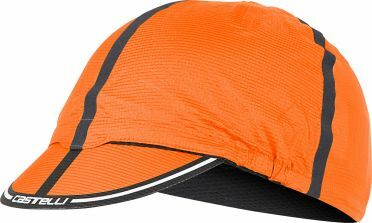 Castelli Ros cycling cap orange men: Castelli wanted to make a cycling cap that’s great in dry weather yet can protect in case of rain. The trick is a patented system in which the windproof, water-repellent front panel can fold back for complete breathability or fold forward to protect. Better yet, you have three ways to wear it: with the protective panel folded back, moderate breathability with the cap turned around backward, or full close. The Pertex fabric is ridiculously thin to fit under the helmet, yet has enough air permeability to prevent you from wetting out as you would under a non-breathable cap. Castelli Ros cycling cap anthracite men: Castelli wanted to make a cycling cap that’s great in dry weather yet can protect in case of rain. The trick is a patented system in which the windproof, water-repellent front panel can fold back for complete breathability or fold forward to protect. Better yet, you have three ways to wear it: with the protective panel folded back, moderate breathability with the cap turned around backward, or full close. The Pertex fabric is ridiculously thin to fit under the helmet, yet has enough air permeability to prevent you from wetting out as you would under a non-breathable cap. 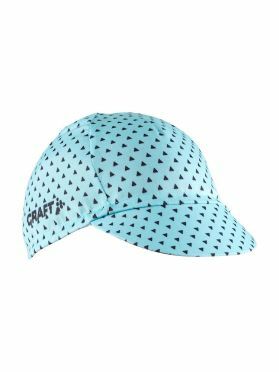 This Craft race bike cap blue is a stylish yet functional bike cap. The cap keeps the sun out of your eyes and ensures that your head can breathe properly. The fabric also quickly drains the moisture so that your head stays cool and dry. Ideal to wear under your helmet on sunny days. One size fits all. 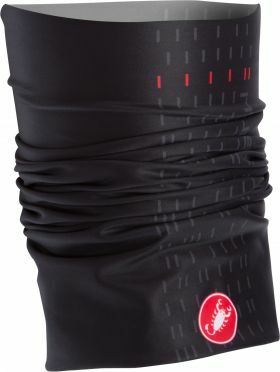 The Castelli Summer headband black men is a headband to wear under your helmet in the summer. The headband ensures that the moisture is better absorbed. Because of this you will suffer less from sweat that drips in your eyes. 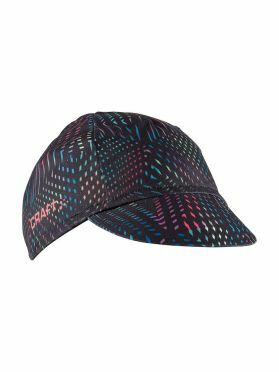 This Craft race bike cap black/multi is a stylish yet functional bike cap. 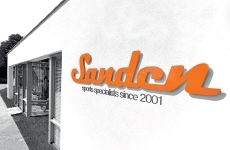 The cap keeps the sun out of your eyes and ensures that your head can breathe properly. The fabric also quickly drains the moisture so that your head stays cool and dry. Ideal to wear under your helmet on sunny days. One size fits all. 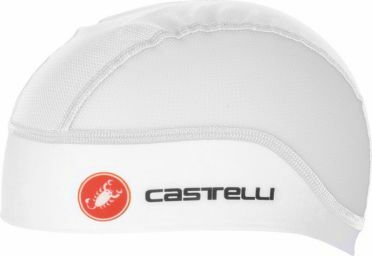 The Castelli Summer headband white men is a headband to wear under your helmet in the summer. The headband ensures that the moisture is better absorbed. Because of this you will suffer less from sweat that drips in your eyes. This Craft race bike cap black/white is a stylish yet functional bike cap. 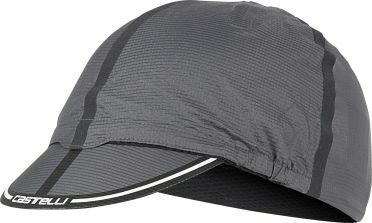 The cap keeps the sun out of your eyes and ensures that your head can breathe properly. The fabric also quickly drains the moisture so that your head stays cool and dry. Ideal to wear under your helmet on sunny days. One size fits all. 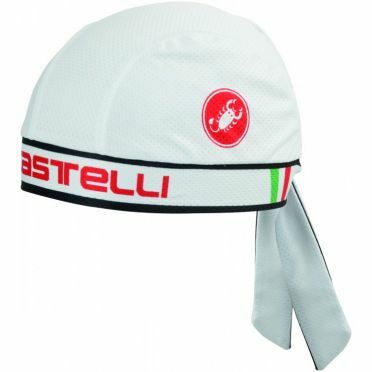 The Castelli Summer skullcap under helmet white men is ideal for temperatures between 5 and 25 degrees. 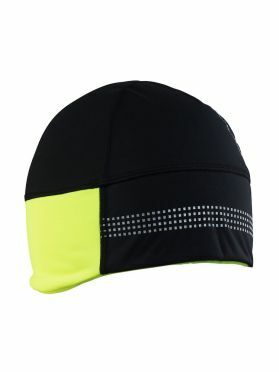 The cap protects against wind and keeps sweat form your eyes. The cap fits easily under the helmet and has a very high breathability to keep your head cool en dry.